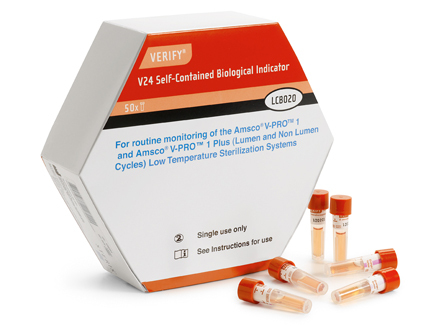 Know the latest method of sterilization verification using genetically engineered biological indicators having spores of Geobacillus stearothermophilus. Sterilization is an important part of pharmaceuticals and hospitals where surgical equipment is sterilized. The media and equipment in sterile pharmaceuticals are sterilized by steam sterilization in an autoclave. Heating of material to be sterilized at 121°C for 15 minutes kills all vegetative cells and spores of microorganisms preventing their growth in media and other favorable conditions. Generally, glassware and stainless steel equipment are sterilized by dry heat sterilization (DHS). DHS is an alternate method for sterilization by heating the material to be sterilized at 250°C for 30 minutes. This method is not used to sterilize the media and other liquid materials. Heat sensitive material cannot be sterilized by this method. The method that is used for sterilization in pharmaceuticals should be validated. Validation of sterilization method is done by biological indicators containing spores of Geobacillus stearothermophilus in the form of strips and ampoules. Ampoules contain bacterial spores as well as growth media. Geobacillus stearothermophilus is a heat-resistant bacterium and can grow at higher temperatures. If sterilization process destroys the spores of these bacteria that we can assure the destruction of all microbes from the media of equipment. Verification of sterilization is a time taking the process and it takes 24-72 hours to get the results because the result of the test depends upon the growth of bacterial spores i.e. turbidity in the growth medium. But recently FDA approved a different type of biological indicators which gives the verification results in just 2 hours. These biological indicators are manufactured by Steris Corporation of Mentor, Ohio and marketed under the name Verify Cronos Self Contained Biological Indicator (SCBI). Verify Cronos are prepared using Recombinant DNA Technology. The stain of Geobacillus stearothermophilus used in these indicators produces an enzyme that gives fluorescence. These genetically engineered bacteria grow and fluorescence is identified easily in growth medium in two hours after incubation if bacterial spores grow after ineffective sterilization. These new bacterial indicators can fasten the sterilization verification process that will help to verify the sterilization of reusable equipment and medical devices.